The Sumerians. Possibly as early as 8000 B.C.E., an ancient race lived in Mesopotamia, also known as the "Fertile Crescent," between the Tigris and Euphrates Rivers. These people were the Sumerians. They made astronomical observations and developed astronomical theories that were later borrowed by invading Semitic people from the North and West. Sumerians invented a form of writing in clay with a wedge-shaped stylus that was an evolution of their earlier pictographs. 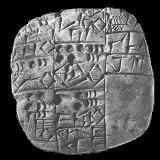 This stylus writing in clay is called cuneiform, from the Latin words cuneus, "wedge," and forma, "shape." By the time of classical Greece, the Sumerian race had been completely forgotten. In 1846, Sir Henry Layard (1817-1894) visited archaelogical digs in the ancient Assyrian city of Nineveh. He found many clay tablets with cuneiform writing. They could not be interpreted at the time but realizing their historical importance, he sent what he found to the British Museum. A Londoner named George Smith (1840-1876) heard of these mysterious ancient inscriptions, and devoted his spare time to studying them at the British Museum. He deciphered tablets found by Layard and others, and the British Museum gave him a permanent position because of his successes. The cuneiform tablets proved to be an invaluable treasure trove. They were remains from the library of Ashurbanipal (668-626 B.C.E. ), an Assyrian king who had all existing cuneiform tablets in the kingdom collected and copied. Thus the library contained a very complete chronology of the earlier Semitic Babylonian dynasties and their culture. Older Sumerian works that still existed were also copied. George Smith is probably most famous for deciphering the Babylonian Epic of Gilgamesh, which included an account of the Biblical Flood. (Later, in 1914, Arno Poebel announced the deciphering of an earlier Sumerian tablet from Nippur that also described the Biblical Flood.) Smith's keen insights allowed him to decipher abbreviations that Sumerians and Babylonians used in astronomical tables. In 1876, George Smith became ill and died while on a final mission searching for missing tablets in the area surrounding Nineveh. As the texts were deciphered, it was realized that the Semitic Babylonian was mixed with an unrelated language. This turned out to be Sumerian. George Smith published the "Annals of Assur-bani-pal" in 1871, and once again the world learned of the ancient Sumerians. The Sumerians referred to themselves as the "Black Heads" (as did later Babylonians). Statues of Sumerians that have been excavated appear similar to some statues from ancient India. Since deciphering cuneiform, Sumerian has been classified as a Turanian language, unrelated to Semitic or Indo-European languages. Modern linguistic research has found similar vocabulary and concepts between Sumerian and ancient languages and cultures of of Sudan and the Dravidians in India. Sumerians also worshipped deities similar to those of the Dravidians, and like the Hindus and Egyptians ascribed numerous qualities to their deities. One quality ascribed to their god En-lil was "Father En-lil, Shepherd of the Black Headed People." The Sumerian year had 12 months, which followed the phases of the Moon and indicated the season. Sumerians wrote the fourth month as the character for "seed" followed by the character for "hand." They wrote the eleventh month as the character for "grain" followed by the character for "cutting." They wrote the twelfth month as the character for "grain" followed by the character for "house." Sometimes their year had to be made longer than twelve months, to bring their lunar calendar in line with the Sun's seasons. In this case, the eleventh month was repeated. Sumerians probably added this extra month when they saw that their annual crops were not ready for harvesting. We can see in the Sumerian calendar two concepts that were also followed by all later surrounding cultures: use of the Moon to determine the length of a month (which began with the crescent first visible after a New Moon), and periodic adjustments to realign the lunar months with a solar calendar. These extra months are known as intercalations. The Sumerians developed the sexagesimal (base 60) counting system later adopted by Babylonians. The Sumerian day and night were each divided into three "watches." Each watch was two Sumerian hours, so a Sumerian day and night had twelve hours. Each hour was divided into 60 minutes, and each minute was divided into 60 seconds. The day ended (and a new day began) at sundown, as in the ancient Hindu and later Semitic calendars. The year had nominally 360 days, and so the heavens were divided into 360 degrees. Habur: β Arietis to the Staff of Orion (66.7°). Ellaser: the Staff of Orion through Leo to Denebola (86.7°). Bad-tibira: Denebola through Boethos to Vega (46.7°). Larak: Vega through Lyra to β Scorpionis (33.3°). Sippar: β Scorpionis to the Great Square (66.7°). Shuruppak: the Great Square to β Arietis (60°). Sumerians appointed priests, and one Sumerian tablet tells us that a high priestess was chosen by "sheep-omen," a practice that continued to the days of the Chaldeans. The other element of the Universe besides Heaven and Earth was "lil," the wind or atmosphere ruled over by Enlil, god of the air. A tablet reference to "the mountain of Heaven and Earth" suggests that in the beginning, Sumerians believed Heaven and Earth were united as a single mountain. Nammu, goddess of the primeval sea, gave birth to An (Heaven) and Ki (Earth). An and Ki gave birth to their son Enlil (god of the Air). Enlil then carried away his mother, the Earth, from Heaven. This three-layer creation parallels with the Vedic Sanskrit invocation "Om, bhur, bhuvah, swaha" (Om, to the Earth, Sky, Heaven), mentioned under India in the history section of this site. Heaven was believed to be surrounded by the primeval sea, both above the Earth. The Earth was believed to be a circular disc. Underneath the Earth was the Netherworld. The planets, Sun, Moon, and stars were considered part of "lil," the atmosphere, that had the additional quality of shining. The journey from Earth to the Netherworld was made with the help of a ferry-man along a river, as with the Egyptian belief that a ferry-man carried the dead along the River Styx, and the Greek god of the Netherworld, Hades (Pluto to the Romans), whose realm was reached by a river journey with the ferry-man, Charon. Overlooking the Sumerian Cosmos, there were numerous immortal gods, each in charge of ruling a specific part of the Universe. Although immortal, these gods experienced human emotions. There were seven "fate-decreeing" gods, fifty "great" gods, and hundreds of minor deities. The four main deities were An (god of Heaven), Enlil (god of the air), Enki (god of the water god of "Abzu," The Abyss, and god of wisdom), and Ninhursag (the Mother Goddess, also known as Ninmah, "exalted lady," and Nintu, "the lady who gave birth"). Ninhursag might at one time have been the Sumerian Earth Goddess, Ki. Of these four gods, Enlil was considered the King. He was worshipped more than all other Sumerian gods. Earthly kings ruled by the grace of Enlil. Enlil also also invented the pickaxe and plow necessary for agriculture, provided favorable conditions for crops, but who could at times unleash destructive catastrophes. This pantheon operated according to "Me," a set of over one hundred divine laws by which order was maintained in the Universe. According to legend after having drunk a little too much beer the god of wisdom, Enki, gives these divine laws to his daughter, Inanna, to take to the Sumerian city of Uruk ("Erech" of The Bible). As Inanna is underway in her ship, the beer's effect on Enki begins to wear off. Realizing what he has done, he conjures up sea monsters to seize Inanna's ship and retrieve the Divine Laws, but tells these creatures to let her proceed to Uruk on foot unharmed. Inanna calls on her messenger, Ninshubur, to battle these sea creatures. He does, and ultimately they reach the city of Uruk with the Divine Laws of "Me." Thus were these laws transmitted to the people of Sumer. Sumerians believed that their pantheon of gods could bring about whatever changes were in their power simply by wishing or declaring events to be so. This belief in the power of a pantheon of immortal gods to bring about world events instantly with a mere declaration would spread to neighboring cultures for thousands of years, from Babylon to Greece and Rome. Sumerians gave sacrificial offerings to appease the gods, a practice also followed by ancient people around the world. The Moon god, who Sumerians called both "Nanna" and "Sin," was the son of the air god, Enlil, and the goddess Ninlil. The Moon was worshipped as having the quality to journey to the Netherworld and to the sky. The Sun god was Utu. Venus was Inanna. Along with the other planets and stars, they were believed children of the Moon. "And God said, Let us make man in our image, after our likeness... So God created man in his own image..." (Genesis 1:26-27). "And the Lord God formed man of the dust of the ground..." (Genesis 2:7). "...for out of it [the ground] wast thou taken : for dust thou art, and unto dust shalt thou return" (Genesis 3:19). Sumerian legends tell of a pure land in the beginning, called Dilmun, that has many parallels with the Biblical Garden of Eden. Although pure, Dilmun had no water. Thus the god of water, Enki, commanded the god of the Sun, Utu, to bring fresh water from the Earth to Dilmun. This parallels Genesis 2:5-6, "...for the Lord God had not caused it to rain upon the earth...But there went up a mist from the earth, and watered the whole face of the ground." Sumerian literature speaks of the "four rivers." This has a parallel in Genesis 2:11-14, which speaks of the four rivers that flowed from the Garden of Eden: Pison, in Havilah; Gihon, in Ethiopia; Hiddekel, east of Assyria; and the Euphrates. With water flowing in the land of Dilmun, the Mother Goddess, Ninhursag, causes grass to grow, and trees to bear fruit, this garden creating Paradise on Earth. Ninhursag creates eight types of sprouting plant in this garden. Enki's messenger, Isimud, brings these plants to Enki to eat. Enki eats these plants, which infuriates Ninhursag, who curses Enki with death and then disappears. Soon eight parts of Enki's body begin to fail, and his health worsens quickly. While the other gods ponder what to do, a fox offers to find and bring back Ninhursag if they reward him for his efforts. The gods agree, and the fox brings back Ninhursag. Ninhursag asks Enki which of his eight parts of his body are ailing. These organs were his jaw, tooth, mouth, arm, rib, and three other parts that were destroyed on the tablets that are known today. Ninhursag then creates eight healing deities, one for each of these organs, and Enki regains his strength. The Sumerian word "ti" has a dual meaning. One meaning is "to make live," which is similar to the Biblical "the mother of all living." Another meaning of the Sumerian "ti" is "rib," and the Bible relates that Eve was made from Adam's rib. The Mother Goddess Ninhursag created the goddess Nin-ti ("lady of the rib") to restore Enki's rib to health. Although the Hebrew words for rib and "to make live" are not related, Sumerians were fond of plays on words and the Bible could have preserved this ancient Sumerian pun with the legend of Eve, the "mother of all living," being created from Adam's rib. According to the Sumerians, the sole purpose of man was to labor for the gods who created him, to provide them with food and a place to reside on Earth. This also has a parallel in Genesis 2:15, "And the Lord God took the man, and put him into the garden of Eden to dress it and to keep it." Sumerians believed in the virtues of a moral life, and of a society free from injustice. Sumerian kings established codes of law centuries before the Babylonian Code of Hammurabi. Sumerologists have also been able to translate a wide variety of Sumerian proverbs. The four principal gods of Sumer (An, Enlil, Enki, and Nintu) were described as bringing the "black-headed people" (Sumerians) to life in a Sumerian tablet that contains a story of the Creation and of the Flood. Unfortunately the one known tablet that contains this epic is badly damaged, but enough survives to reconstruct part of the story. The tablet describes how there was one pious king, Ziusudra, who was told that a flood would come to destroy mankind. This flood lasted for seven days and seven nights, as Ziusudra's giant ship was tossed about in the flood waters. Finally Utu, the god of the Sun, shines his rays upon the ship. In gratitude, Ziusudra sacrifices an ox and a sheep. Ziusudra then bowed before An and Enlil, who then gave him eternal life and who "in the land of the crossing, the land of Dilmun, the place where the Sun rises, they caused to dwell." The King of gods, Enlil, became known as "Marduk" to the Babylonians that followed, and Enlil's epithet of he "who forever decrees destinies" probably carried over to Marduk's possession of the "Tablet of Destinies." The Babylonians. Semitic tribes lived north and west of the Sumerians in an area called Akkad. Gradually more migrated to Mesopotamia and invaded the land of Sumer, home of the Sumerians. Eventually (around 2500 B.C.E.) the Semitic king Sargon of Agade brought all of Mesopotamia under his rule. His son, Naram-Sin, and following kings referred to themselves as "rulers of Sumer and Akkad." Their language is called Akkadian. Although the Semites ruled Mesopotamia following this conquest, the Sumerians were still the scribes and civil servants. Their cuneiform writing thus was adopted to writing the Semitic language, and their culture and learning were passed on to their conquerors. In the dynasty of Hammurabi (1792-1750 B.C.E. ), the capitol of the kingdom was moved to Babylon. These Semites then came to be known as Babylonians. The picture at left shows the top of a steele containing the Code of Hammurabi. The Semites recorded dated financial transactions (such as land sales, rents, and loans) in their temples. Because of this, today we have a very complete chronology of the succession of Babylonian kings and a detailed knowledge of the Babylonian calendar. The twelve Babylonian months by the time of Hammurabi were Nisannu, Airu, Simannu, Duzu, Abu, Ululu, Tishritu, Arach-samma, Kislimu, Tebitu, Sabatu, and Adaru. Like their Sumerian predecessors, Babylonians began their lunar months at the first appearance of a crescent Moon following the New Moon. When a thirteenth intercalary month was necessary, Babylonian priest-astronomers repeated the last month, Adaru. If a correction was necessary sooner for their crops then they could repeat the sixth month, Ululu, although this was rare. In Babylonian astronomical writing, months were written as the first character of their former Sumerian names. At first, addition of a thirteenth intercalary month in the Babylonian calendar was irregular. Sometimes two thirteen-month years occurred in a row. Apparently, Babylonians determined the need to add a month from the condition of crops or signs of the weather. Later, the Babylonians determined the start of each month by the heliacal rising (rising just before sunrise) of a particular star. Babylonians further assigned three stars to each month: one for the beginning, one for the middle, and one for the end. Babylonians could have shared this concept with the Egyptians, who had a system of "decans," one every 10°, with 36 in the Zodiac. The 36 stars defined the solar calendar far more accurately than had been possible before. They named their 12 months after constellations that appeared during those months, and attached astrological meanings to the months that are still in vogue today. Babylonians recorded eclipses and many other observations. There is even evidence in the Strassburg Cuneiform texts that Babylonians could solve the quadratic equation for x: ax2 + bx + c = 0. Today, we count on the decimal system of one to ten. The Babylonians counted on a sexagesimal system (instead of decimal) that counted from one to 60, which they borrowed from the Sumerians. Babylonians also used a seven-day week. They named each day for one of the visible planets, and the Sun and Moon: Monday was named for the Moon; Tuesday for Mars; Wednesday for Mercury; Thursday for Jupiter; Friday for Venus; Saturday for Saturn; and Sunday for the Sun. Next to the Sun and Moon, Babylonians held Venus in the highest regard. The Babylonian word for planet was "lubat," which translates as "stray sheep." They named Venus Nin-dar-anna, "mistress of the heavens," and referred to the Sun, Moon, and Venus as a triad of deities. An account of the Creation relates how the god Marduk (the Babylonian counterpart to the Sumerian Enlil) became King of all other gods by slaying Tiamat (Chaos). The Babylonian tradition was to recite this epic on the fourth day of the New Year's Festival. The first five tablets are believed to date to the Amorite dynasty (the first Babylonian dynasty), while the last two tablets are believed later additions dating to the Kassite dynasty, after Hammurabi's time. Anu first created the four winds, then stirred up dust in a whirlwind, and then brought the flood wave. From the pieces of the body of Tiamat, Marduk created the Earth and the heavens, and the other gods named him ruler of the entire Universe. The later Tabelt 5 tells how Marduk caused the Euphrates and the Tigris to flow from the slain Tiamat's eyes. He named Babylon the abode of the gods on Earth. Marduk slew Qingu while battling Tiamat, and seized the "Tablet of Destinies" from him (similar to the Sumerian epithet for their King of gods, Enlil, "who forever decrees destinies"). Marduk then used the blood of Qingu to make Primeval Man, to do the work of the gods so the gods could enjoy their leisure. The Sumerians had this same rationale for man's creation, and believed that man's reason for being was to serve the gods. He ordained the year and into sections he divided it. The Moon god he caused to shine forth, the night he entrusted to him. He appointed him, a being of the night, to determine the days. The passage continues to describe the Moon as having horns during the first six days, a half-crown on the seventh day, at its midpoint on the fifteenth day, beings to disappear as it approaches the Shamash (god of the Sun, Sumerian god Utu), and on the thirtieth day the year begins again. The Babylonian word for the fifteenth day, "shabattu," is a cognate of the Hebrew Shabbat" (Sabbath). The Egyptians could very well have gained their astronomical and mathematical knowledge from the Babylonians and the Sumerians before them. "Fixing" three stars for the twelve months as quoted above could be a parallel to the Egyptian decans, with 36 stars (3 times 12) each representing 10° of the zodiac. The Assyrians. Eventually another Semitic people invaded from Ashur in the north, conquering the once vast Babylonian empire, and becoming the most powerful kingdom in the Middle East around 800 B.C.E. They shared the Addakdian language with Babylonians. This language is sometimes also called Assyro-Babylonian. One of the descendents of the original Assyrian invaders was King Ashurbanipal (668-626 B.C.E. ), whose library in Nineveh copied and preserved much of what we know today of ancient Babylon and the long-forgotten Sumerians. Before these cuneiform texts were deciphered in the 1800s, the Western world only knew of Babylon from a few anecdotes in the Bible and in ancient Greek writings. Under Ashurbanipal, the Assyrian kingdom stretched as far as the Gaza Strip to the west, Armenia to the north (towards the Black Sea), Media in the east (towards the Caspian Sea), and to the Persian Gulf to the south. Ashurbanipal had all cuneiform texts from Babylon and Sumeria collected and brought to Nineveh for copying. During British excavations in the 1800s, over 13,000 fragments were recovered from his library. Assyrian priests developed astronomy further, recording observations and improving methods of predicting the movement of the Moon, planets, and stars. At the height of their development, they were able to predict eclipses with reasonable accuracy. Babylon's Return to Power. By 606 B.C.E., the Assyrian Empire fell through struggles with the Cimmarions in Europe, the Medes in Persia, and the Babylonians in Babylon. This brought Babylon back to power. The Babylonian King Nebuchadnezzar (604-561 B.C.E.) restored much of the land that was previously Babylon. Babylon was later conquered by the Persians in 539 B.C.E. By this time, Babylonians were able to calculate ephemerides by going back in their records the required amount of time for each planet. The "phenomena of Sirius" of 27 years is not clearly understood, although 27 is 19 plus 8 (two different intercalary periods, as mentioned earlier) — yet there is no record of Babylonians ever having alternated the 19- and 8-year intercalary cycles. Babylonian tables of daily positions of planets over their synodic period (to construct ephemerides) have been found dating back as early as 523 B.C.E. In the late Babylonian empire, Babylonian astronomers recorded celestial phenomena in terms of 31 Normal Stars (Mul-Sid) that were along the Ecliptic Plane. These stars had a large gap of about 60° between δ Capricorni and η Piscium. This gap skips over Aquarius. There are also no stars from Sagittarius, though in earlier times that constellation included part of what is now Ophiucus, and θ Ophiuci is one of the Normal Stars. In any case, we do not know today why there was such a large gap. Alexander the Great and the Macedonians. The Persians in Babylon were overthrown by Alexander the Great of Macedonia (356-323 B.C.E.) around 336 B.C.E., whose empire spread from Egypt to the western border of India. The picture at the left is a coin bearing the image of Alexander the Great. Following Alexander's conquest, Babylonian science and culture spread to Greece. The Greek astronomers borrowed the constellation names we still use today from the Babylonians. We also know today from Greek chronicles that the Babylonians used water clocks (cylinders of water with a hole in the bottom), with the passage of time marked by the level of water. With these water clocks, the Babylonians recorded times of star passages that appear to be transit times across the meridian. In 311 B.C.E., the Macedonian Seleucus (who had served under Alexander the Great) returned to take power in Babylon. He numbered 311 B.C.E. as Year 1 of his reign, following the practice of kings before him. However, his successors continued numbering years sequentially after his death, referring to the year of the Seleucid Dynasty. This period is known as the Seleucid Era (S.E.) in Asia Minor, and spanned 311-64 B.C.E. In Seleucid Era dates, years 1, 4, 7, 9, 12, 15, and 18 in the 19-year cycle had a 13th lunar month (starting with 311 B.C.E. as year 1 S.E.). Seleucid moved his capitol to Antioch, but Babylon remained a seat of learning. By the Seleucid Era, Babylonians had developed tables for predicting eclipses. They calculated that eclipses happened in succession every six months for five or six occurrences, then predicted the return of the pattern in 18 years. The Rise of Alexandria and the Decline of Babylon. With the Seleucid capitol moved to Antioch, and the establishment of its harbor, Seleucia, Babylon's importance gradually diminished. The scientific knowledge of Babylon was passed along to surrounding Greeks and Persians. Alexandria, on the Mediterranean Sea, became the major center of trade and culture. The famed library of Alexandria was reputed to contain 500,000 books. Alexandria's Mouseion was a research center with astronomical observatories. Alexandria was the new center of trade routes between Europe and India. Alexandria's scholars had access to the wisdom of Babylon and of ancient Egypt, and the city's trade exposed it to Indian thought as well. This seaport remained an important center of trade for the next thousand years. In 181 B.C.E., the Parthians conquered Mesopotamia and cut it off completely from the Mediterranen. Isolated from the old trade routes, Babylon quickly faded from memory. The Chaldeans. Chaldea was a province in the Babylonian kingdom that spread south of Babylon to the Persian Gulf. The Chaldeans spoke Aramaic, a Semitic language from which the Hebrew and Arab languages developed. Chaldean priest-astronomers studied the heavens for ceremonial dates of the gods they worshipped. They began their astronomical tables by saying: "In the name of god Bel and goddess Beltis, my mistress, an omen." Chaldean astronomical tables calculated a planet's heliacal rising and heliacal setting, and stations and meridian crossings. Their tables included compensations for the gradual acceleration and then deceleration of planets as the Earth made its yearly journey around the Sun. They used a constant acceleration and deceleration, with relative motion following a sawtooth pattern. Even the Babylonians knew that the acceleration and deceleration of planet velocities and latitudes was not constant. The Chaldeans sought to improve the original triangular sawtooth increase and decrease in velocity and latitude. They contrived one scheme for velocities where planets moved slightly faster in one half of the year than in the other, during the time we now know the Earth was closer to the Sun and so orbited faster. Chaldean priest-astronomers also approximated the Moon's increase and decrease in latitude as follows. They started with an ordinary triangle wave that ranged from -6 units to +6 units. From -6/5 to 0 and from 0 to 6/5, they doubled the slope. Above 6/5, they added 6/5 to the total and used the slope of the ordinary triangle-shaped wave. Below -6/5, they did the same thing. This resulted in a new pattern that ranged from +7 1/5 to -7 1/5 (that is, +36/5 to -36/5). Used to represent the Moon's +5° to -5° latitude, each unit would represent 25/36 of a degree. The purpose of the resulting complicated table was discerned by Otto Neugebauer. Later, the Greeks would use a more accurate sine wave approximation to represent this motion.